Pure Energy Confirms High Lithium Values in Claystone Sampling Program on Glory Claims, Clayton Valley, Nevada | Cypress Development Corp.
Vancouver, BC – Please find below a News Release issued by Pure Energy Minerals (TSX-V: PE) this morning regarding Cypress Development Corp. (TSX-V: CYP) (OTCBB: CYDVF) (Frankfurt: C1Z1) Glory Lithium Project located in Clayton Valley, Nevada of which Pure Energy is earning an interest. VANCOUVER, British Columbia, Nov. 28, 2016 (GLOBE NEWSWIRE) -- Pure Energy Minerals Limited (TSX VENTURE: PE) (FRANKFURT: A111EG) (OTCQB: PEMIF) (the “Company” or “Pure Energy”) is pleased to announce results from its systematic rock sampling program with Cypress Development Corporation (TSX VENTURE: CYP) (“Cypress”) on the Glory Claims (the “Property”) in Clayton Valley, Nevada. Anomalous boron (B) and potassium (K) trends that correlate with the high Li values. Company and Cypress geologists have also conducted the first geological mapping on the Property. The dominant rock type hosting the high lithium is Tertiary claystone, likely belonging to the Esmeralda Formation, which has been widely reported to host lithium associated with clays. Overlying the Tertiary sedimentary rocks (shown as Ts on Figure 1) is Quaternary aged alluvial material (Qal on Figure 1) that is sourced from older bedrock to the east. Mapping has determined that the younger alluvium covers portions of the lithium-rich Tertiary sediments, so the lithium-bearing sediments are likely to continue beneath the covering sediments. 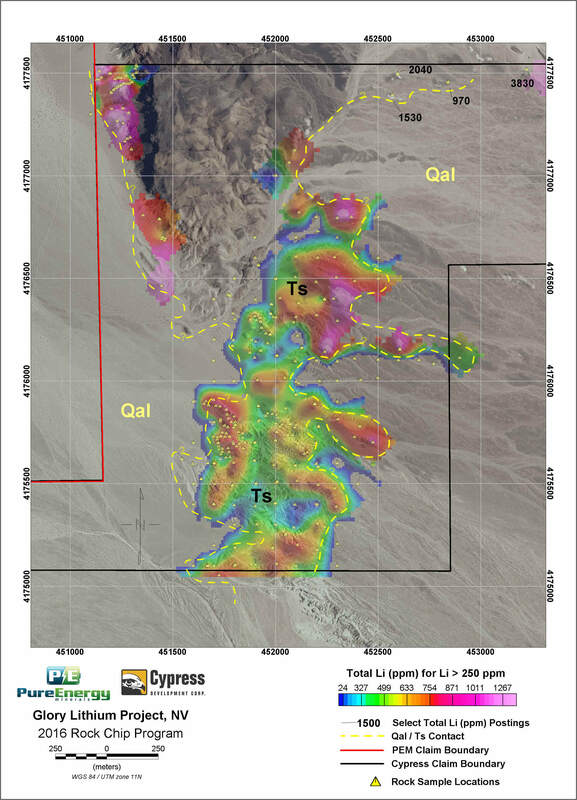 Pure Energy and Cypress designed the sampling grid to better understand and expand upon the areas of anomalous lithium identified in earlier sampling. The laboratory reported lithium plus more than 30 elements from a four-acid digestion and ICP-AES finish, while also reporting boron and lithium from an aqua regia digestion. While prospecting and mapping activities generated some of the new data, the new grid is important because it systematically covers large areas of Tertiary outcrop. In most cases, geologists collected representative samples on nominal 100-meter spacing. Figure 1 is a map of the resulting lithium geochemical data on the Property. The area of Tertiary outcrop is consistently enriched in lithium, but younger Quaternary aged sediments cover the prospective sediments and extend into the Clayton Valley basin to the west. The geologists collected a line of samples near the northern property boundary as the Tertiary sediments re-emerge from the Quaternary cover. These turned out to be some of the highest-grade lithium samples in the survey. The technical team interprets this northern area of highly enriched lithium to connect beneath the covering sediments with the large anomalous lithium areas further south. The lithium potential also continues to the north, where Cypress controls the adjoining claim block. Including the Cypress sampling to the north, the corridor of high lithium in these Tertiary sediments is interpreted to extend for more than four kilometers. Highly anomalous lithium occurs in all of the major rock types encountered on the property except for the conglomerate and gravel (Quaternary), but the abundant claystones consistently contain the highest lithium content. The map also includes an area of much older Paleozoic rocks that are not prospective for this type of lithium mineralization (dark areas in the upper middle of the map). The analytical results discussed in this release were reported by ALS Minerals laboratories. ALS Minerals maintains ISO/IEC 17025:2005 and ISO 9001:2008 certifications, provides clients with all internal quality control data, and maintains a library of detailed laboratory analytical methods required as the necessary documentation for NI 43-101 reporting. In addition, the Company’s sampling program included a rigorous quality assurance protocol: analytical control samples, replicates, and field duplicates. About Pure Energy Minerals Ltd. Pure Energy is a lithium resource developer that is driven to become a low-cost supplier for the burgeoning lithium battery industry. While the Company is currently focused on the development of the CVS Lithium Brine Project and the adjoining Glory Lithium Clay Project in Clayton Valley, Nevada, it is actively evaluating new lithium targets in North and South America. An active business development program, applying its expertise to the evaluation of new lithium targets around the world. Forward Looking Statements: The information in this news release contains forward looking statements that are subject to a number of known and unknown risks, uncertainties and other factors that may cause actual results to differ materially from those anticipated in our forward looking statements. Factors that could cause such differences include: changes in world commodity markets, equity markets, costs and supply of materials relevant to the mining industry, change in government and changes to regulations affecting the mining industry. Forward-looking statements in this release may include statements regarding mineral processing, adaptation of test work to larger scale and/or future operational scales, estimates of reduced future capital and operating expenses, delivery of a preliminary economic assessment, future exploration programs, operation plans, geological interpretations, and mineral tenure issues. Although we believe the expectations reflected in our forward looking statements are reasonable, results may vary, and we cannot guarantee future results, levels of activity, performance or achievements.